Hawaii Trip | Lanai Part II. Okay, this is my final Hawaii post, and I’m embarrassed to admit it’s taken me a whole month to finish posting on our Hawaii trip! Well, that just goes to show how much we crammed into our week-long stay on the two islands. Just looking at all the photos bring back so much fond memories already. After our afternoon of lounging at the beach, me with my beloved kindle on iPad and Alan with his deep sleep and snores, we then transitioned over to the poolside. Honestly, neither of us could get enough of that comfy daybed and as a result, we’ve been browsing around the internet looking for one to put on our front porch since we’ve been home! After lunch, Alan scooted off to his much anticipated spa treatment while I picked Bridgette up from the Kids’ Club to enjoy more swimming in the pool. When I picked her up, she was in the middle of a craft project, decorating a picture frame with seashells. She couldn’t stop talking about all the fun things she did in Kids’ Club, and I nearly had to drag her out of there! Ice cream breaks were graciously offered by the Four Seasons staff, and both Bridgette and I willingly accepted! After Alan reemerged from his relaxing massage, he joined us in the pool, and the three of us soaked up every bit of that sunshine until the beauty of the twilight reminded us that we were famished. Without warning, Bridgette suddenly decided to take a dive in the pool for the first time. That girl knows no limit! That night, Bridgette begged us to take her night swimming again. I swear, that girl’s got more energy than five of me combined! The next morning, I met up with my lovely host, Cassie, for a thorough site inspection of the entire Four Seasons properties. They have a ton of different event spaces within the two resorts, and all of them are pretty darn amazing. 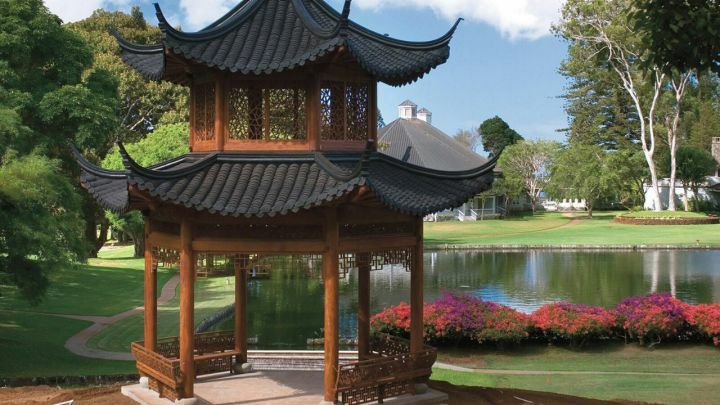 My favorite, though, has got to be the 12th hole on their spectacular golf course, which is the exact spot where Bill Gates chose to exchange his vows. You’re literally standing on a cliff, surrounded by the ocean. Talk about an unobstructed view! Our 2 hour tour ended with a delicious lunch at the Four Seasons The Lodge at Koele, which is where we would spend our last night in Lanai. The absolute BEST chili I’ve ever had in my life! After lunch, I reunited with Alan and Bridgette, who had checked out of Manele Bay that morning to enjoy the facilities of The Lodge at Koele. By the way, the Four Seasons make it an extremely seamless transition when you move between the two properties. You don’t have to worry about checking in/out, your luggages are automatically transferred, and there is a shuttle bus that circulates between the two properties every half an hour. Where did I end up finding my hubby and baby? By the pool of course! They spent the entire morning there, despite the drop in temperature at The Lodge, being that it was higher up in the mountains. Bridgette was swimming by herself, chatting it up with her new friends–an elderly couple vacationing in Lanai, who found my daughter to be quite an entertainment with her singing and endless questions. Alan was lounging on one of the pool chairs, with his iPad as company. It took some coaxing to get Bridggy out of the water, but we finally made it into our room, which turned out to be another upgraded corner deluxe room, courtesy of Cassie! It had a spacious balcony overlooking the bowling lawn, with just a massive amount of greenness surrounding us. After being by the coast for 2 days, it felt really good to be by the mountainside for a change of ambient. It was so quiet and serene there, and you’re just absorbed into the beauty of nature. The room itself resembled a cottage by the countryside, with floral valences, tiled bathroom, and a two-poster bed. 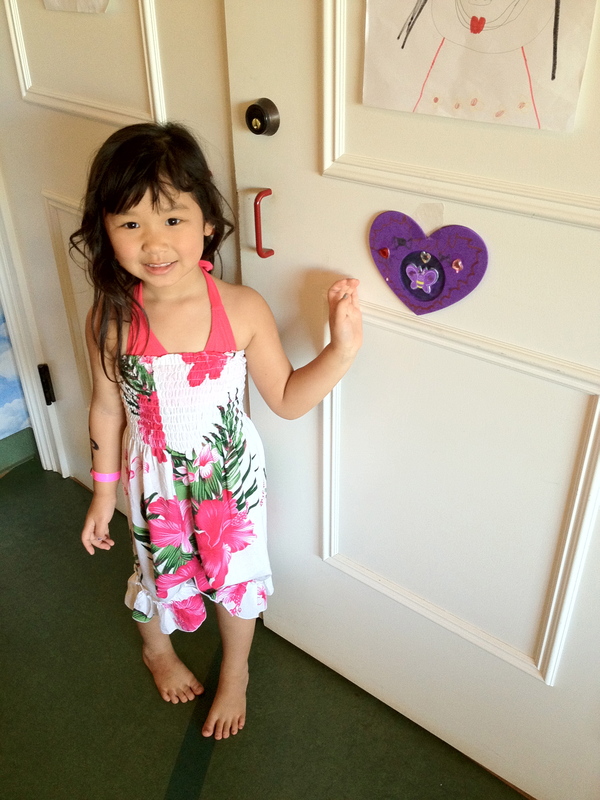 Special amenities and touches were found all around the room, just like at Manele Bay, and Bridgette happily adopted another family member which turned out to be a horse this time. Very fitting for the mountainside! That afternoon, we explored the property at Koele. It’s much quieter than Manele Bay, with little treasures tucked here and there, such as the beautiful orchid green house we came across. Words really can’t describe the beauty of the property, and neither can photos do it enough justice. 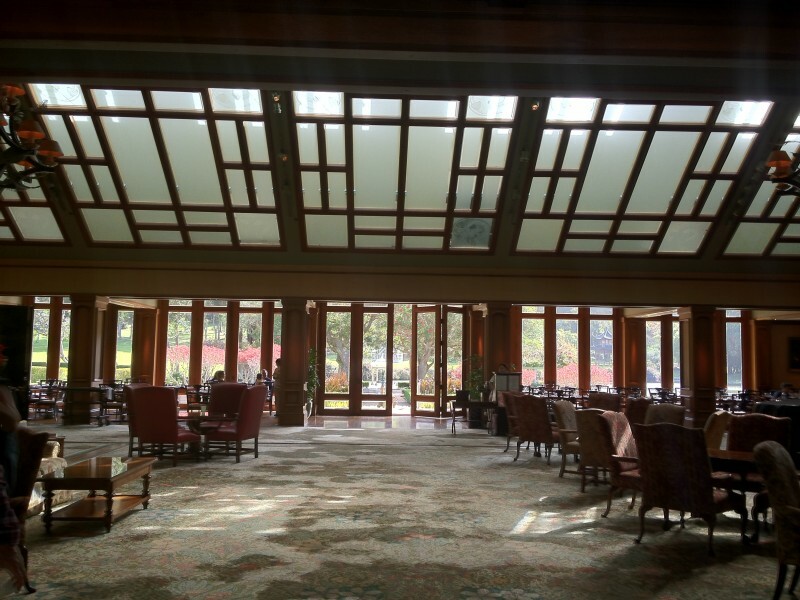 I actually love The Lodge more than Manele Bay, and I’ve come to realize why. As much as I adore staring out into the ocean, I love the way the mountains make me feel. Being a fast paced person who is “on the go” pretty much all the time, I have found that the mountains make me feel a lot calmer, stiller. It just has the capability to relax me entirely, from the inside out! I love that feeling! Another lovely photo taken by Bridgette! We were embracing, and she had the iPhone on her, so she asked us to turn to look at her and click (! ), she caught the moment on camera! Love these reading/napping nooks at The Lodge, and by the fireplace too! After exploring the property to its entirety, we sat down to enjoy afternoon tea (Bridgette’s favorite) in their lounge area. The nice cowboy didn’t miss a beat. He took her hand and introduced her to a gentle brown horse, pointing to the patch of hair on his head and explaining that his horn fell off in an accident. Convinced that the horse was indeed an injured unicorn, Bridgette happily giddied up on him. Bridgette rode around the stable, as I followed behind, and she excitedly waved to all the other horses we passed. We also made some stops along the way, to see some of their farm animals. There were baby goats (SO adorable, just a few days old! ), chickens, and a 300 lb pig named Willy! Bridgette loved feeding Willy, and Willy kept snorting in appreciation. We spent a good chunk of time there, before Mr. Cowboy asked Bridgette if she wanted to bathe her unicorn. Ofcourse, she responded with an enthusiastic YES! Before we left, Mr. Cowboy also taught Bridgette how to rope like a real cowgirl! She did pretty well, and was given the recognition of an official cowgirl. Yee-haw! We went back to the resort to meet up with Alan again, and enjoyed some croquet and lawn bowling before a wonderful dinner that ended with my favorite house made s’mores! The next morning, we awoke to some strange sounds outside, and found a troop of turkey trotting across the bowling lawn right outside our room! We enjoyed the property a little more before packing up our bags to leave….it was definitely a hard good bye! Previous PostHawaii Trip | Lanai Part I.